1. I know it's still summer, but this soup from Barefoot Contessa could work year round. 2. Remember when I featured Chicks & Stones in this blog post? Well their online store has finally launched! 3. I'm headed here next week for a work trip. How gorgeous is this view? 4. I spend way too much going out for coffee, especially in the summer. I just discovered these delicious iced coffee K Cups...so good! 5. Last night was the Patriots first preseason game and that means football is officially back! 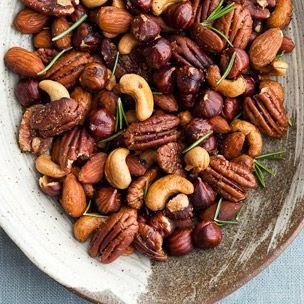 I'm already scouting recipes for game day snacks and these mixed nuts look so good and so easy. What a busy week! Sorry to be absent from the blog but I had a work event on Wednesday and I'm getting ready for another one in California next week. I'm also headed to the Cape this weekend with some friends for a quick getaway and I am so ready for it! Above are some reads and ideas for your Friday.